Apr - 25 | By: Green Production | 3 comments. We were there for the Going Green Week taping and the set looked amazing, complete with a digital waterfall and greenery -both live and re-useable manufactured greens. Vanna was even sporting some snazzy eco-dresses, all creations of local designers; EcoSkin, EcoVibe Apparel and Jet Clothing. 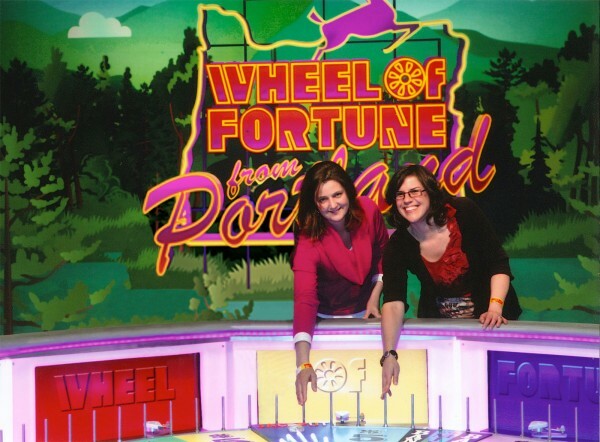 The wheel and puzzleboard, along with the show’s other electronics, were driven to Portland from Sony Pictures Studios in Culver City, California aboard tractor trailers powered by low-emission, biodiesel fuel. 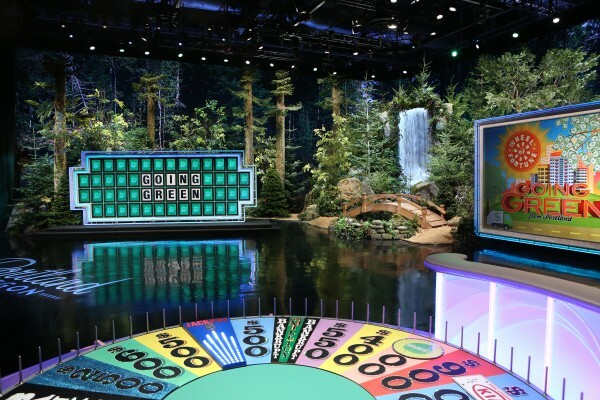 Wheel of Fortune’s art department designed and built the eco-friendly set with all natural materials (10,000 pounds of it), water-based paint and reusable greenery. The show intended on donating any reusable wood, carpet and soft goods to local schools and theater groups (there is no official list yet of where at the time this blog was written). The staff and crew also did their part by using TriMet, to move around the city. Organic crew meal leftovers were all composted. Biodegradable cups and aluminum water bottles were used in place of plastic bottles on set. Wheel of Fortune and Sony worked with a local recycler, IMS Electronics Recycling, to give Portland residents an opportunity to recycle their old electronics safely and responsibly. Participants at the recycling event also had the chance to spin a wheel for prizes including a Wheel of Fortune VIP Experience and Sony gift cards. The grand prizes were eco-friendly cars (Chevrolet Volt, Nissan Leaf, Toyota Prius and Toyota Highlander Hybrid)….you will have to watch to see if anyone won one! Other prizes throughout the shows included gift packages of eco-friendly products from Seventh Generation and trips from GreenEarthTravel.com, Aruba Nature Sensitive Tours and Earth River Expeditions. 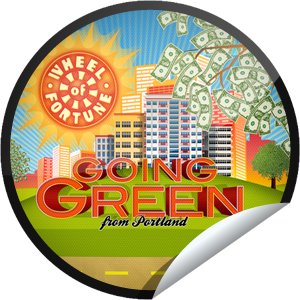 All in all, it was impressive what the Wheel brought out and highlighted to show off Going Green in Portland. I am wondering what the name of the waterfall is used on the set today. Pat and Vannah keep up the great work! The waterfall is Multnomah Falls and it is located in the Columbia Gorge (less than a 30 minute drive from Portland). Enjoy your visit to Portland!